This article submitted by Erin Aagesen on 5/24/00. High school students and pre-schoolers have had the opportunity to learn from each other this spring through a program at the high school. The parenting and child development class conducted "Preschool Playschool" sessions twice a week from April 25 until May 18. The sessions were held every Tuesday and Thursday. "It gave the students an opportunity to observe ages and stages of a child's development," said Karen Odberg, instructor, of its value to her students. Fourteen preschool students between the ages of three and five were involved with the program, which was run entirely by the parenting and child development students. 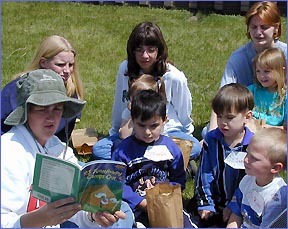 Susie Pelzer reads a book about camping during Camp Day for the preschool play school. Listening are: (front) Francis Christian, Jonah Christian, and Ryan Meyer; (back) Daisy Berg, Kayla Flanders, Michelle Novak, and Natasha Meed. The activities at each lesson were based on the physical, intellectual, emotional, and social development of the preschool child. Each lesson had a separate theme that all the activities were centered around. Some examples of the themes were: zoo animals, rainbows, teddy bears, and nursery rhymes. Each day included free play, organized play, a lesson, a craft project, a snack, and songs. On Thursday, May 11, the theme was Mother's Day. The preschoolers learned to say 'I love you' in sign language, planted a flower for their mothers, played a variation of Simon says, called "Mom says," and had a snack of strawberry heart-shaped jello jigglers. The program was free. Registration for the preschoolers was done on a first come, first serve basis. Bonnie Meyer chose to enroll her three-year-old son Ryan. "He's at the age where he's kind of shy," said Bonnie. Because she is a stay-at-home mother, she wanted to expose her son to other children, and teach him to respect adults other than herself. "If he learned something from the different activities, that's great, too," she added. Michelle Wolbeck was one of the high school students supervising the preschoolers. "It actually went really well," she said. "At first, the kids were shy, but by the last day, they didn't want to leave. It was a lot of fun."